Is it a Behavioral or Medical Problem? Whenever you observe a dog licking his lips, you must have assumed that he might be eating something, must have eaten something previously, or anticipates eating something soon. But what if you did not find any food near to him and he still licks his lips...What does that mean? Lip licking is a way by which dogs communicate. As you might be knowing, that apart from verbal communication, dogs also communicate using body languages and try to express their feelings. Lip licking is also a way of body language communication by dogs. A dog licking his lips wants to tell everyone else using body language signals as to what he is feeling. And as a Good Dog Owner and Parent, We Should be able to read and understand our dog's body language signals and their feelings. Why do Dogs Lick Their Lips From a Psychological Point of View? Lip licking is the term coined to indicate that a dog is licking their lips. 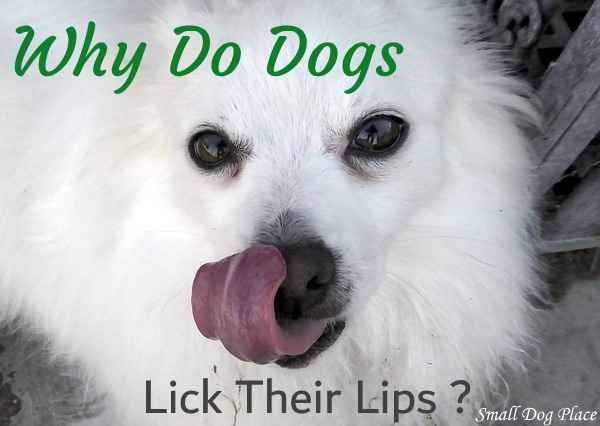 There are various emotional reasons why dogs will lick their lips or even lick the air. The anticipation of food is a very common reason why dogs will lick their lips and one in which most dog parents observe on a daily basis. The presence or scent of food will trigger the licking response due to increased salivation. Dogs will also lick their lips after eating to assure they have gotten every last crumb. If your dog observes you eating, he may also lick his lips in anticipation that you will give him some. They are telling you they want food and since they don't have a spoken language, they convey this message to you by using body language signals. Lip licking by dogs is often referred to as an appeasement gesture. This means that dogs who lick their lips are feeling stressed, anxious or they are not comfortable with something going on around them. Their licking is their way of calming themselves down. Something around them makes them feel anxious because they perceive it as a treat. Consider this example of an appeasement gesture. Imagine you return home after your work and you find your dog has made a mess of the living room by jumping on furniture or tearing up some paper. You start scolding him and showing aggression, and your dog starts licking their lips. They do this to convey the message to you, the owner that he (the dog) is not a threat to the owner, even though the person is behaving in an aggressive and scolding manner. 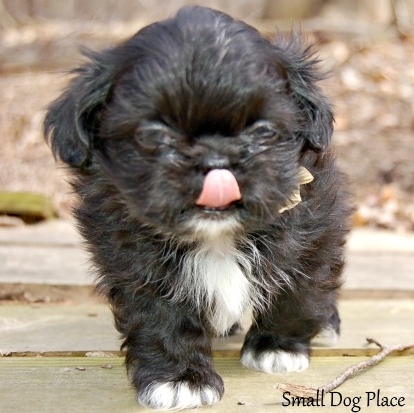 Licking his lips is a way for this Maltese Shih Tzu hybrid puppy to calm himself down. Another reason for lip licking is when dogs get confused as to what is happening around them. You may have observed lip licking sometimes in the training sessions with your dog. If you have seen them lip licking, this means they do not understand what’s happening and what is expected of him from his owner. This confusion leads to stress and anxiety. You may notice your dog is licking his lips when you both are in a new or different environment or situation. An obedience class is one example where the dog may be stressed or confused. Puppies placed in new situations will also lick their licks. Often your attempts at socializing your dog will create some anxiety. The dog will use lip licking as a way to calm themselves. As the dog becomes more confident, through your attempts to mentally stimulate him, the licking behavior will lessen. You will be training his brain to learn more and learn more effectively. I really advise you to try Brain training for dogs, a book designed for the mental stimulation of dogs and make them more intelligent. You can also read brain training for dogs review. Why Do Dogs Lick Their Lips: Is it a Dominance Issue? This correlates both to appeasement and to reduction of stress, but it is different enough to deserve its own category. Dominance goes back eons to dogs in the wild. A mother dog would leave the den to look for food. Once found, she would eat as much as she could and then return to her den and her awaiting pups. The puppies would great their mother by licking her face and neck. To an outsider, this behavior may look like the puppies were very happy to see her again and would display their affection for her return. In reality, the puppies were licking their mother in anticipation that she would regurgitate the food she had consumed so they could eat. This behavior is not normally necessary today, but remnants of it remain and can be transferred to confer a submissive behavior. Young puppies will lick older dog as a way to suggest, "I'm no threat, don't hurt me." This is a dog to dog behavior telling older dogs that the new puppy does not need to be feared and therefore, don't hurt the puppy. This behavior also transfers to people. Consider how many young puppies great people. Licking. 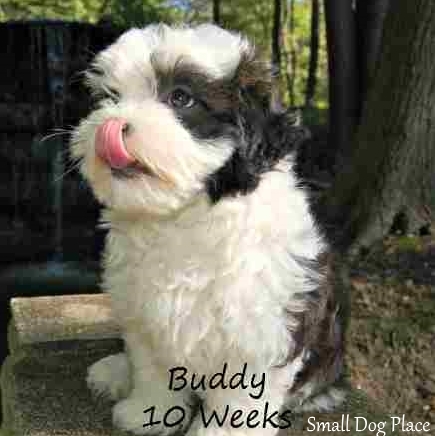 Dog people will be enamored by this behavior and choose a puppy based on his overall friendliness. Friendlessness is measured by the amount of licking or more commonly "kisses" he gives. It is a win-win situation for both puppy and person. When you notice your dog licking his lips, he is either alerting you to his mental state but he could also be telling you he has a physical problem that deserves your attention. 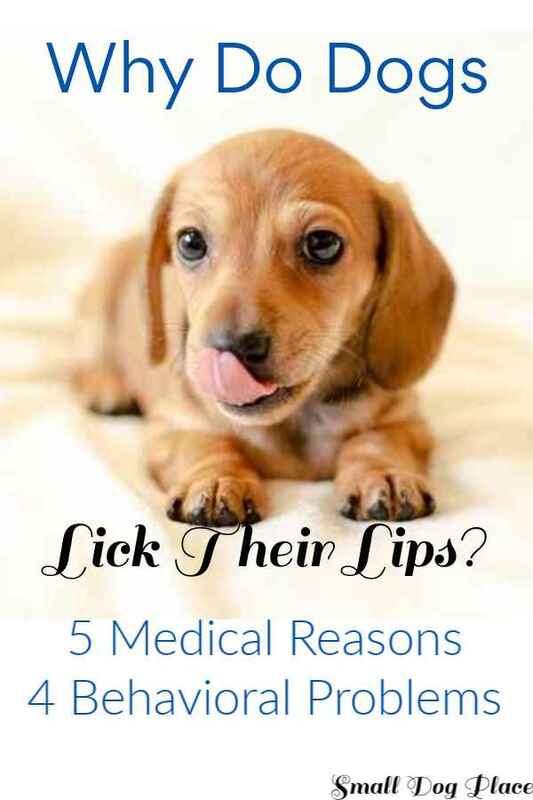 If you can rule out the psychological reasons why a dog might lick his lips, there are various health concerns he is trying to explain to you. Pain coming from somewhere in his mouth is a common reason why a dog may lick. It could be a painful tooth, an ulcer or sore in his mouth, a tumor or growth that is causing pain, or something he swallowed and is irritating the inside of his mouth. Even if you can't see anything immediately, it is advised to have your dog seen by a vet. The problem could be farther down in the larynx or GI tract. Sometimes a dog will lick something that was cause distress such as a foxtail in the grass or something poisonous. If you have never noticed this in your dog before, consider it a medical emergency and call your vet. Dogs that lick their lips or seem to lick the air may be having a seizure. This rather bizarre behavior of licking and trying to snap at imaginary flies may indicate that the dog has a seizure disorder. Contact your vet immediately if your dog acts very tired or listless after one of these episodes. He may have epilepsy. Bloat occurs rarely in small breed dogs, but if your dog is drooling, pacing, or tries to retch, the dog should be seen by an emergency vet. These can be the signs of a life threatening condition called bloat. Bloat is when a dog's stomach expands due to food, fluid and gas. Treat this as a medical emergency. Dogs may lick their lips if they are dehydrated as a way to add more moisture to their body. Dehydration can be caused by a number of situations including heat stroke in hot weather, or an underlying medical problem such as diarrhea or vomiting. Some dogs just don't drink enough water. Try to encourage your dog to drink, but also call and make arrangements to see your vet. Dehydration is a serious medical problem that may involve veterinary steps can't do at home. Sometimes a dog will lick her lips if she is feeling nauseous. If you notice this and your dog is not throwing up, backtrack to determine if perhaps she ate some she should not have eaten or worse ye, she ate something toxic. Sometimes if a dog has access to grass, she will nibble on it to force herself to throw up. If you suspect your dog is nauseous, call your vet. 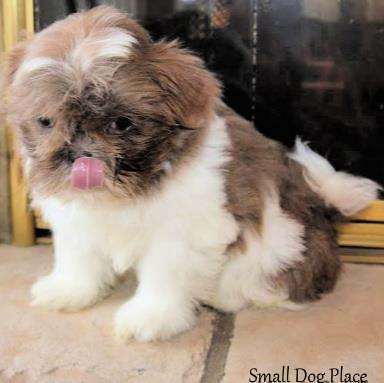 What to do when you Observe your Dog licking his Lips? While Lip Licking is a gesture often considered to be submissive and appeasing, it also means if your dog is under stress or threat, either psychological or medically. So it is essential that you as a dog owner know what to do when your dog licks his lips. Though lip licking means that your dog is getting defensive, it doesn’t indicate that they will still behave submissively. So whenever you observe a dog licking his lips, leave him alone and let him get comfortable and feel secure. Observe for clues as to what is happening and what he is experiencing. If you suspect it is a health related problem, call your vet. If you think it might be an emotional response, determine what might be at the route of it. If you observe your dog lip licking during the training, it most probably means he has no idea what he is supposed to do. In this situation, try and end the training session on a positive note and get some kind of a result from him and reward him with treats. If you think your dog has been placed in a situation that makes him nervous, reduce his stress by removing him to a safer, less stressful location. For more content on training your dog, check this section. Author bio : I am Angad Singh, a passionate dog trainer and a dog parent from last 3 years :). I am very passionate on training a variety of dogs and how dogs behave under different conditions.